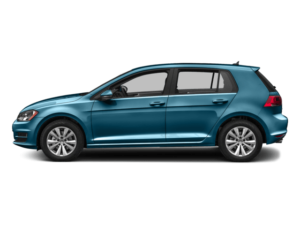 Few compact cars are as versatile as the Volkswagen Golf. It’s available as a 4-door hatchback, a wagon, or one of two sport models, all offering different amenities and performance perks on the solid foundation of a reliable lineup. 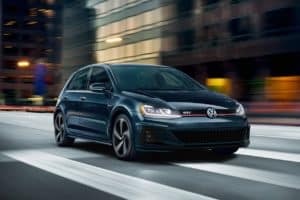 Drivers in Lee Summit, North Town, Overland Park, Mission, and Olathe can learn more about the 2018 Volkswagen Golf vs 2018 Volkswagen GTI sport model with our comparison. Most Volkswagen Golf models use a 1.8L turbocharged 4-cylinder engine, which generates 170 horsepower. This engine has refined styling and ample acceleration perfect for most drivers. The Golf GTI expands on this capability with a 2.0L 4-cylinder engine that produces 220 horsepower and 258 lb-ft of torque. This engine shuttles power through a 6-speed manual transmission, though a high-performance 6-speed dual-clutch automatic is optional. This sport vehicle is designed with a firmer suspension for a balanced, linear ride that improves on the rapid acceleration of this engine. The Volkswagen Golf has humble but attractive styling that varies throughout the lineup. The hatchback models have a 2-box form with a large roof pillar and a boxy shape that improves its utility, while the wagon options employ some bold details and subtle accents to differentiate them from the competition. The VW Golf GTI looks slightly different than the VW Golf, but it still builds on that basic style. Red brake calipers, 17-inch wheels, and a rear diffuser give it a distinctive look that’s rounded out by twin tailpipes and aggressive side skirts. Inside, all models share the same style. Cloth or leatherette upholstery, unique color palettes, and a logically arranged dash with a focus on accessibility highlights the interior, with small details like tartan plaid for the Golf or a race-inspired trim for the GTI separating the two. Another area in which the Volkswagen Golf and the Golf GTI differ is their trim levels. Though they’re part of the same lineup, the sport versions receive their own trim level lineup to bundle different performance options and features than the standard lineup. The Golf includes power accessories, a leather-wrapped steering wheel, and a 6.5-inch touchscreen infotainment system that comes standard for the base model. Additional upgrades include dual-zone climate control, leatherette upholstery, and an 8-inch touchscreen infotainment system, as well as a host of advanced safety features. The Golf GTI has many of the same features but adds performance enhancements, such as individual suspension settings, full leather upholstery, an adaptive suspension, and a moonroof. For advanced safety features, the GTI includes LED headlights, Blind Spot Monitor, and Autonomous Emergency Braking. Whether you’re looking for the excitement and entertainment of the Golf GTI sport model or you prefer the comfort and convenience of the traditional Golf, you’ll enjoy the same value across the lineup. Drivers in Lee Summit, North Town, Overland Park, Mission, and Olathe can learn more about the 2018 Volkswagen Golf GTI and the 2018 Volkswagen Golf by visiting Volkswagen Lee's Summit. Call or stop by Volkswagen Lee's Summit to schedule your test drive!